It was our second to last day at school and we decided to have some fun. 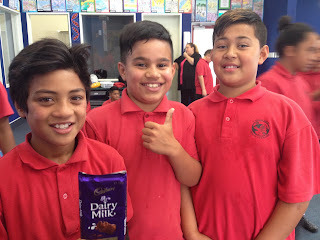 Our first game was the chocolate game. There were two plates with a cake of chocolate and forks and knives on each. Children had to roll a six and put on three items: one on their head, one of their face and one on their bodies. If there were already two children changing and another person rolled a six then they had to tap one out and start putting on their costumes. The second game we played was the Balloon Stomp game. Each child was given a balloon and had to blow it up. They were given a piece of string and tied one end to the balloon and the other end to around their ankle. When the teacher said go, each child could run around and stomp on another person's balloon. Once your balloon is popped, you were out. The last person with their balloon still inflated and around their ankle was the winner. We had two winners yesterday: Kurtas and Simon but they were so good to include Noah as well.